Bright and airy modern ground floor 2 bedroom apartment sleeps 6 comfortably. Refurbished winter 2017 with high standard of fixtures and fittings. Living room has comfortable sofa bed. Both bedrooms are large with built in wardrobes. On suite bedroom with double bed. Bedroom 2 offers 2 single beds. Second bathroom offering power shower. Golf course views from the large covered terrace and BBQ area. Relax on the large patio on the comfortable sofas with a glass of rose while watching the children in the pool. Electric shutters on all windows and doors ensure highest security. Ideal for families or golfers. 6 golf courses within a mile. 5 minute walk to the Millennium golf clubhouse serving excellent food inside or on the terrace over looking the golf course. En-suite bathroom to bedroom 1 with bath, wc, bidet, shower, sink. Bathroom with shower, wc, sink. Lounge with sofa bed and chairs. coffee table, breakfast bar, TV, DVD player with selection of dvds, Sky TV. Board games and kids toys. Fully fitted modern kitchen includes induction hob, electric oven, fridge freezer, washing machine, microwave, dishwasher, kettle and toaster, iron and ironing board. Cool boxes for the beach. Adult and kids games are available. Lovely gardens with large pool and kids pool. Very well maintained gardens. Gated for security and peace of mind. Terrace with chillout sofas, bbq and dining table for 6. Sun loungers for your use. The terrace is perfect for a glass of wine while watching the chidren in the pool or on the lawn. One of the worlds best golf destinations Vilamoura has 6 courses within a mile. 5 mins walk to Millenium/Laguna clubhouse. All other courses 5 mins drive. Suitable for wheelchairs as there's a ramp at front of property. Notes on accommodation: Fully air-conditioned apartment with top quality fixtures and fittings. Entrance hall opens into the open plan kitchen and living room. The kitchen has all modern appliances and utensils. Breakfast bar perfect for breakfast or family dinners. The large living room has a sofa bed and two chairs. The Large terrace is accessed from the living room and on suite master bedroom. The two large bedrooms have built in wardrobes. Owned by young family so benefits include free use of travel cot, high chair, and children's toys and DVD,s. Outside: Lovely enclosed gardens with large pool and children's pool. Fantastic large terrace with table and 6 chairs ideal for BBQs or chilling with a glass of wine. Outdoor sofa area for chilling out. Sofa and 2 armchairs with umbrella to relax in the sun or shade. Cleaning / Towels / Linen / Maid service: Beach/bath towels and bed linen provided. Meet and greet service at apartment on arrival. Beautiful modern luxury apartment, would not hesitate to use here again, and recommend it. I’m glad you enjoyed your stay it was a pleasure having you. 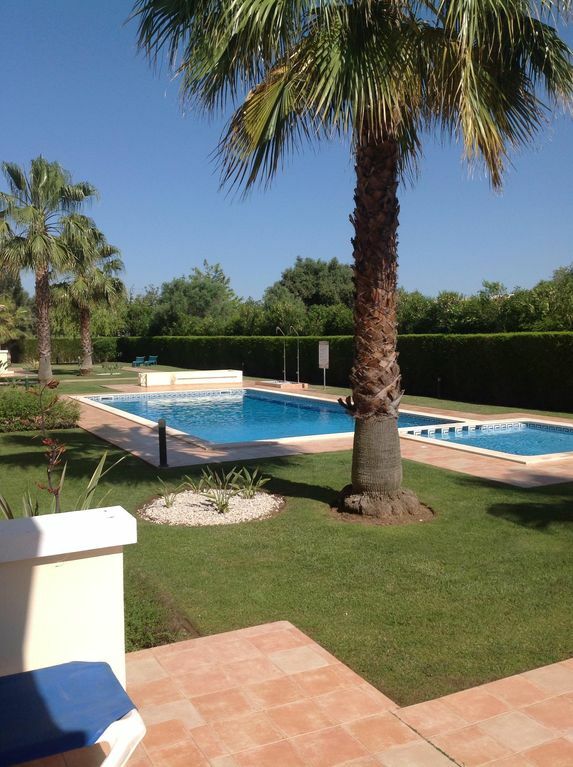 Excellent location - few minutes drive to Vilamoura or a lovely walk. Apartment is modern and has everything you need to enjoy your holiday. Pool and gardens are very well maintained. The owner is easily contactable and responds quickly to any queries. We have used this apartment a few times now and are looking to back next year too! Thank you for your kind review Lyn it was a please having you stay with us again. I think it was the 7th year. Hopefully we can welcome you again next year. Superbly decorated apartment with many finesse touches on top and an immaculately kept complex that is in keeping with Vilamoura itself. Top tips would have to be: Visit the beach and Praca at Vale de Lobo, try the watersports out of the marina itself and if any member of your family are vegatarian or vegan visit Raízes - Cozinha Saudável & Vegetariana a short drive away and just off the beachfront in Quarteria. It's a quirky restaurant with freshly made cuisine. Great time had by all and will be looking to return. Beautiful modern apartment, Great location. Thank you for your kind review I’m glad you and your family had a great holiday. Hopefully we can accommodate you again. Spacious apartment very clean and welcoming. Gardens and pool well maintained ideal fir the kids. The marina area is amazing with bars and restaurants. The owner recommended a transfer and we were met by Mario on time and it took about 20 minutes to get to the apartment. We were met by the property manager and shown around. First impression was wow the photos do not do it justice. Looks like it has been modernized recently and everything is modern and clean. All rooms are spacious with plenty of storage. The kids loved the pool and we loved watching them with a rose wine. Want to go back definitely. Thank you for your kind review Michelle. I’m glad you enjoyed your holiday and hopefully we will see you again. The stunning Falesia beach is 3-5 mins by car. Albufeira and Vale do Lobo both 15 mins by car. Zoo marine dolphin park and Aquashow water park are great days out and 15 mins by car. The apartment is 20 minutes drive from Faro Airport. Full map and directions are available. Vale do lobo 10 miles. Booking Notes: To book please email or call. A non-refundable deposit of 20% is required to confirm your booking with the balance payable 8 weeks before you arrive. Damages to be paid for. Changeover Day: flexible Notes on prices: Prices are for the property per week in UK pounds. We do however accept short stays and weekend golf trips. Big discounts for long winter stays.